Born in Roehampton, England in 1987, Sam Bird has a long and successful junior career behind him, and is well known for being a Mercedes F1 test driver in the past. 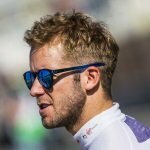 Bird has proven to always be a force to be reckoned with in Formula E, being able to score several wins and especially showing strong performances in qualifying. The British star-driver has been with the Virgin Racing squad in the electrically-powered racing series from the very beginning, playing a key role in the team’s success. Bird started racing in Formula BMW UK in 2004, finishing 2nd in his sophomore campaign in 2005. 2006 saw him finish 4th in a competitive Formula Renault UK series, before stepping up to British F3 for 2007. After another 4th place, he moved over to Europe and competed in the F3 Euroseries for two years, capping off his time in F3 with a third place in the 2009 Macau Grand Prix. 2010 saw him move up to GP2, where he took one win on his way to 5th in the standings. He remained in GP2 for 2011, finishing 6th in the standings. 2012 saw Bird become a Mercedes test driver as well as competing in Formula Renault 3.5, where he finished 3rd behind fellow Formula E racer Robin Frijns, and Jules Bianchi. He returned to GP2 in 2013, finishing runner-up behind another Formula E racer in Fabio Leimer, before a switch to the WEC in 2014 which has so far brought him three class wins. In 2016, he joined Ferrari in their race for success in the endurance championship in the LMGTE Pro class, after he won the LMP2-class the year before with G-Drive Racing. He also successfully took part in the 24 Hours of Le Mans, finishing third in the LMP2-class with G-Drive Racing in 2015.